It's time to take a look back at the best colouring books, published in 2017, that crossed my radar. Remember this is a list of my favourites and there are many books that I just don't get to see. 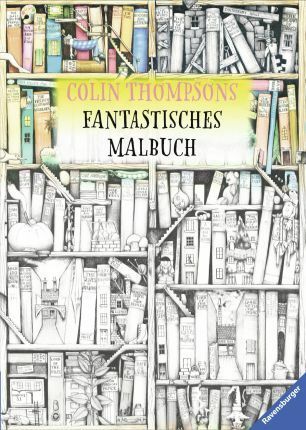 There seem to have been significantly fewer books published this year, so I have a top 3 rather than top 5. 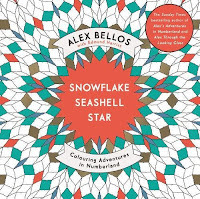 In the number slot this year is a book that I feel will suit colourers at all levels, from the beginner to the artist. 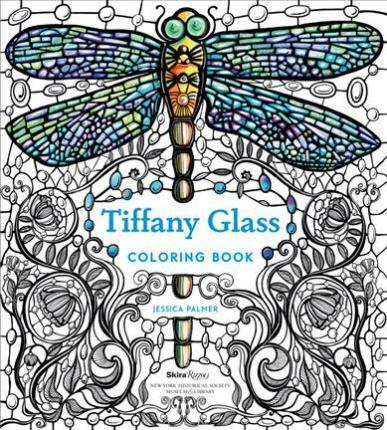 It is Tiffany Glass by Jessica Palmer. 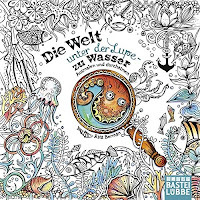 Jessica is an amazing artist who we know best from her Tangled series of colouring books - Tangle Wood, Tangle Bay and Tangle Magic. She also specialises in paper-cutting. You can read my review of Tiffany Glass, with video flip through - here. 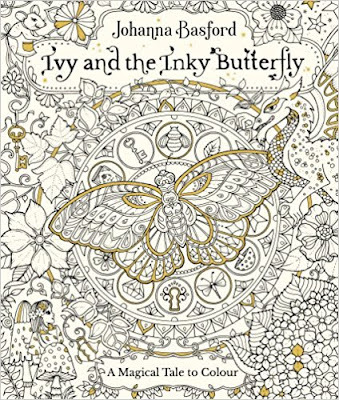 In second spot is Johanna Basford's Ivy and the Inky Butterfly. You can see Johanna's own flip through video - here. This was a change in direction for Johanna into incorporating her artwork around a story. 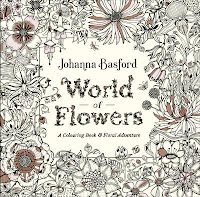 It is still a substantial book with a lot of colouring in it, in a style that we are so familiar with. 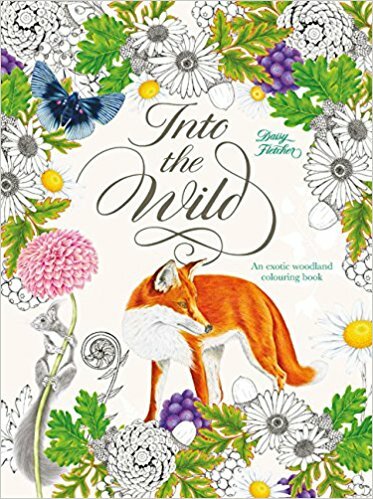 It's a charming book with beautiful borders framing the text. In third spot is a book that came out early in the year and is by the winner of my top award last year - Leila Duly. 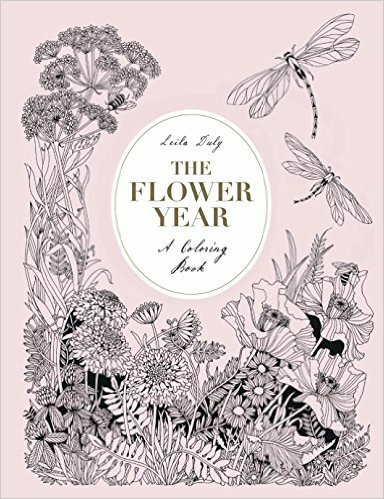 There has been some amazing colouring from The Flower Year - review and flip through here. 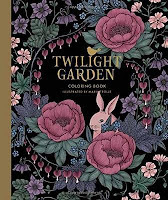 The book follows a Northern Hemisphere year of flowers and fruits in the garden. 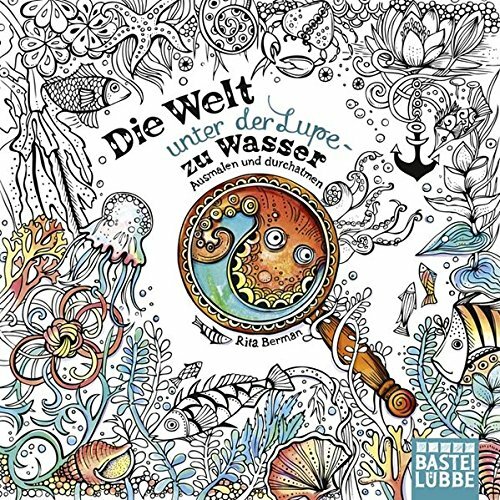 The drawings are beautiful. What a pity though that the book ignores that those of us living in the Southern Hemisphere have completely different flowers in bloom for those months. It's not a big criticism but it could have been avoided by perhaps giving the book a seasonal rather than a monthly focus. 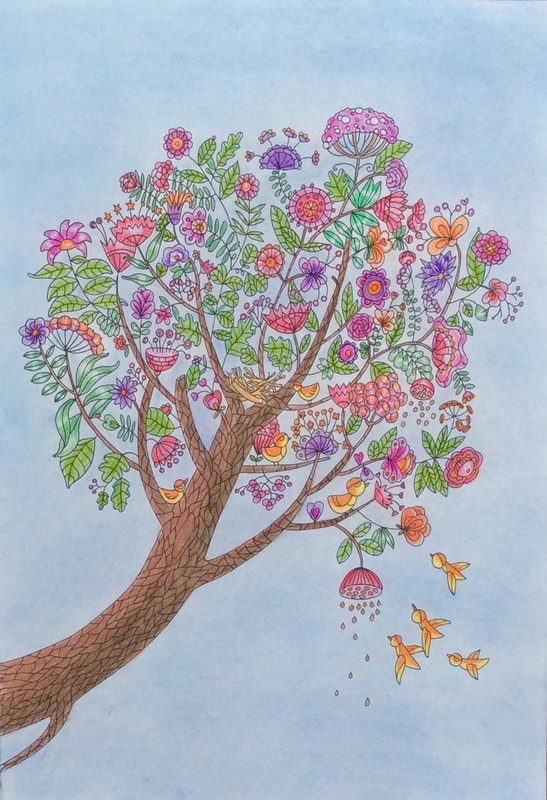 You can read about my Top Colouring Books for 2016 - here. 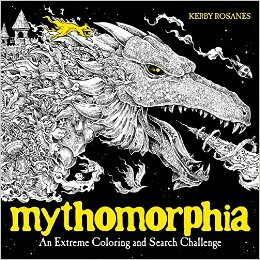 Colouring the Whole Book in 2017 - here. 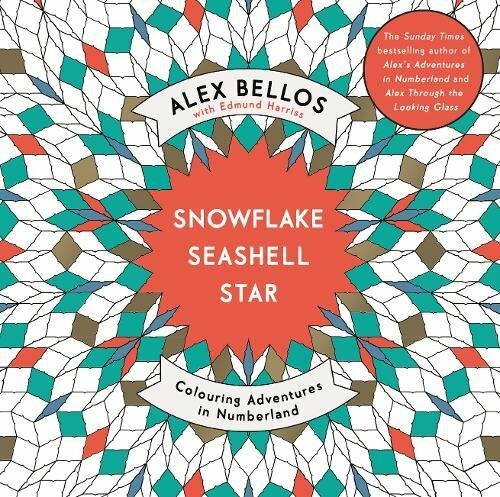 Some time ago I came across this intriguing idea from Alex Bellos who has produced some colouring books of patterns, based on maths.
" 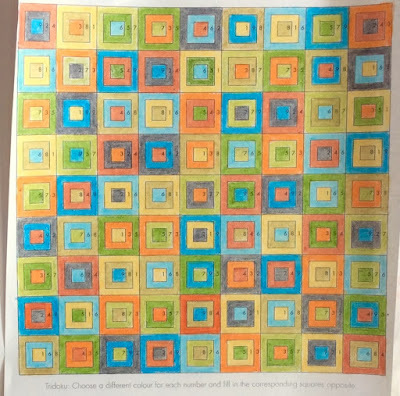 If you colour in a (solved) Sudoku so that each digit represents a different colour – so 1 is, say, red, 2 is blue, and so on – then each colour will appear only once in each line and column. The result is a multicoloured patchwork that, while not symmetrical, is perfectly balanced and harmonious." 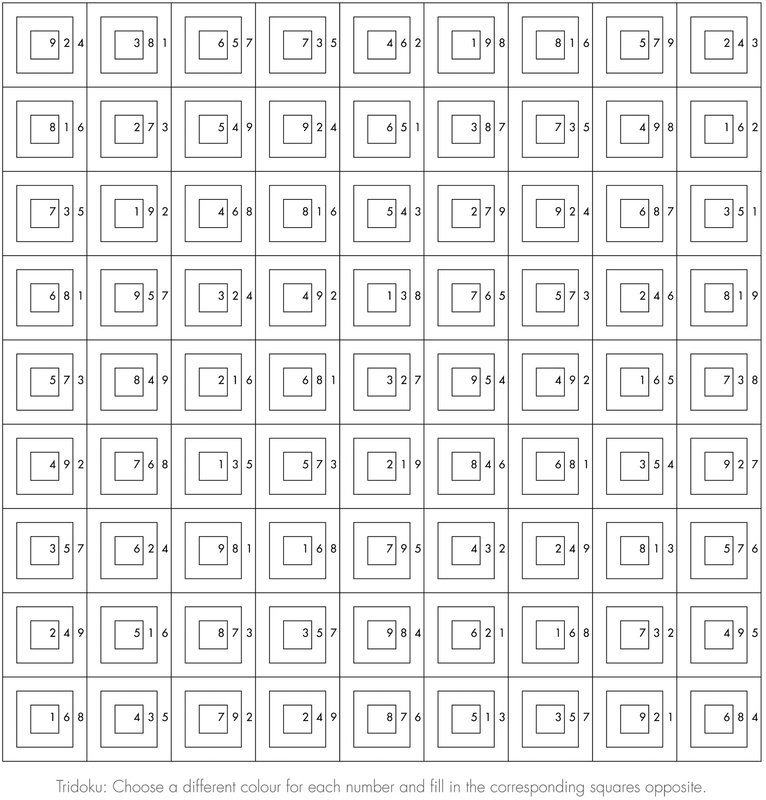 You can download the template - here. 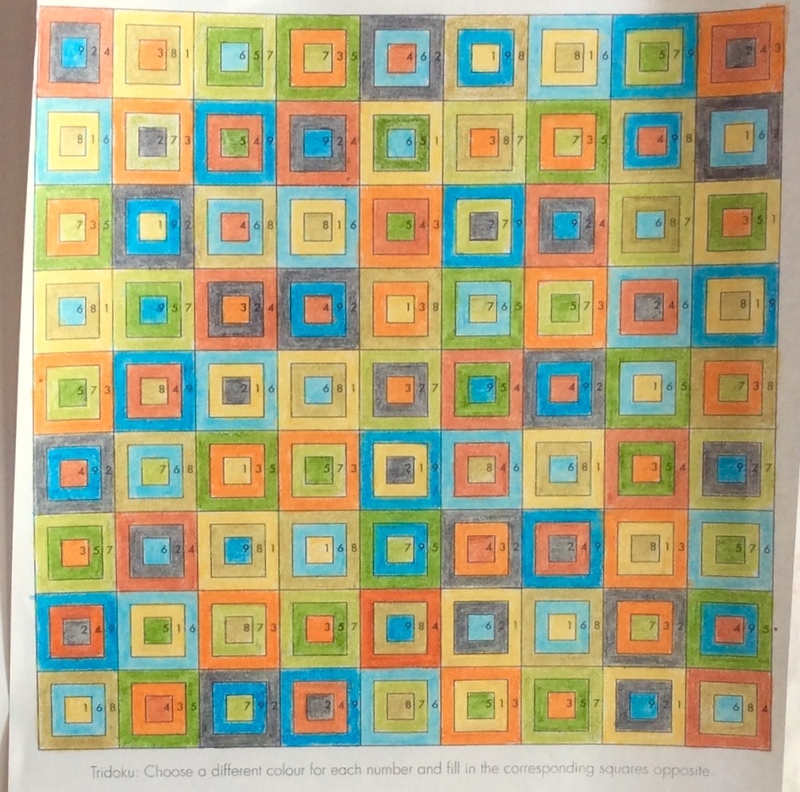 Select 9 colours and allocate one colour to each number up to 9. Then simply colour in all the numbers as set out on the chart. This is a useful and interesting way to test out colour palettes and I've done several as you can see below. It's also great to chill out with when you don't feel like tackling a colouring. Mostly I use marker pens but it's easier to get into the corners with pencils. 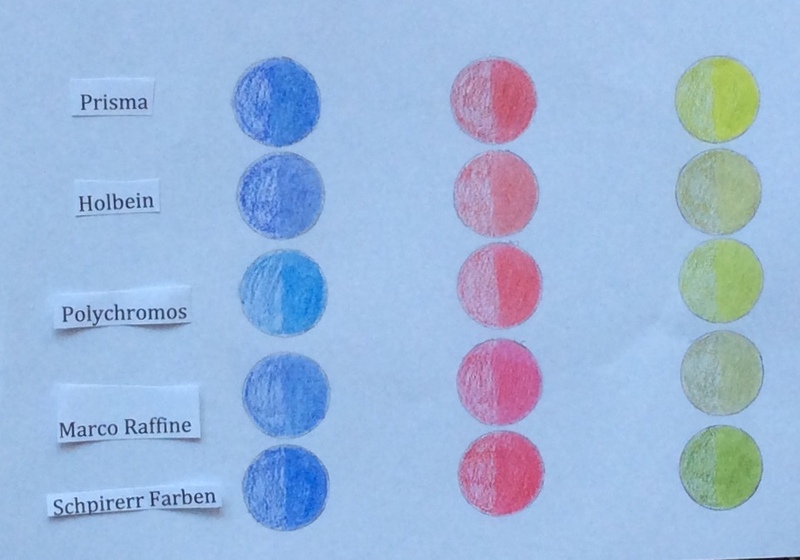 Impression of Schpirerr Farben Pencils - here. Extra Dark PanPastels - here. 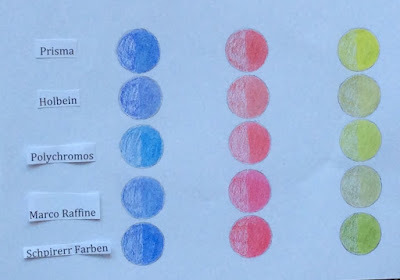 It was about three weeks ago that I first heard about Schpirerr Farben pencils, in comments in a Facebook group. 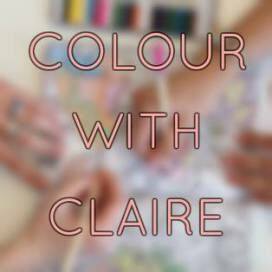 Now I have my own set and in this post I share the first impressions of three other colourers as well as my own. It's taken me about a week to spell them correctly! You can buy them at Amazon US - here. - Schpirerr Farben pencils come in a 72 pencil set only at present. - They are available only on Amazon US here - and on Ebay. - They are made in China. - They are oil-based pencils, most similar to FC Polychromos with some of the silkiness of Prismacolor. - The website is here - where you will find various colour charts and sheets. 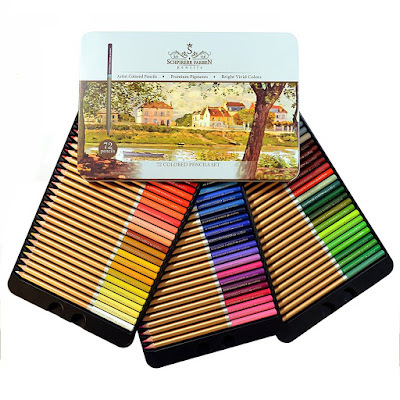 - The pencils come in an excellent, smaller tin, in three layers that hold the pencils firmly so they don't move around. Colour chart with similar colours grouped together, except for a couple of greens at the end! Here is a comparison chart with similar colours. The right hand side of each circle has had Gamsol rubbed over it to get the pigment into the ordinary photocopy paper. "In a nutshell – WOW. I'm super impressed with these. PROS - They're honestly excellent value for money. Pretty darn close to FC Polychromos. They're almost as smooth as a Prisma pencil but with the harder core. With the colour swatches I've done I pressed pretty hard to get the brighest layer and no breakage whatsoever. They blend beautifully and lay down really smoothly. There is a little bit of “dust” buildup when colouring, almost like a waxy bloom but they are oil based according to the website. The core also seems to be long lasting. With swatching and testing out blending, the pencil still doesn't need sharpening. I havent tried sharpening them, so no feedback on that as yet. In all honestly this only happened when I was really pressing down hard on the swatches. They're bright, vibrant and come in different size sets, up to a size 72. There's also a couple of colours which are not found in other sets I currently own. CONS – There are no colours listed on the barrel of the pencil and the dipped tip is nowhere near the colour in most instances when comparing them to the actual colour when lay down. They are also not in numerical order. The numbering seems totally random, I can only guess that maybe they're maybe planning to bring out a bigger set to fill the gaps? There is a colour chart which you can download off their site as well as a chart with suggestions for colour combo's. (They were smoking their socks when they did this) Lime green and French Grey!" Would I buy another set, YES!!!
" I got mine today and have done a scribble with a fair number of them. Very good colour payoff, the mix of hard/soft is where I like it and they feel like decent quality pencils. 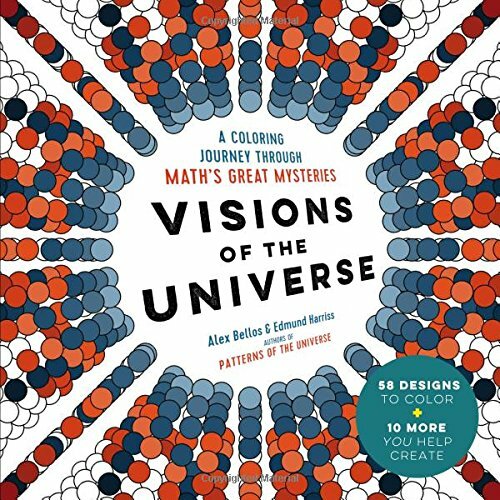 I've got to do a picture in a book with them to really judge but first impressions are excellent. Well worth the purchase." "I really LOVE them - so smooth to colour with. I've only done the swatches so far but looking forward to doing a picture. As soon as I received my tin of 72 SF pencils I couldn’t wait to try them – I found them to be so creamy to colour with and they blend very well that I am really going to enjoy them. Perhaps not as smooth as Hobeins or Prismacolour Premier but if you don’t have either of those then SF will be a great set – you won’t be disappointed. 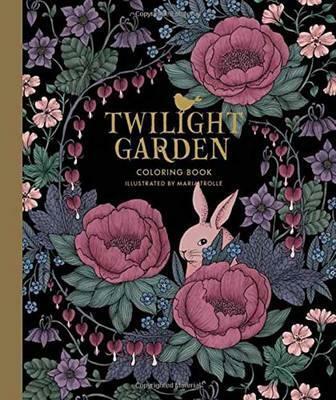 As there are 72 colours and not 120 or 150 there is a limited colour range especially in the browns and greys but for me I didn’t find that a problem as I have plenty of those colours from other set. Personally I love the colour range. Even if shipping to NZ is expensive the total including shipping is around $90NZ which is still a great price for these lovely pencils. You cannot buy open stock (yet). I notice they have an electric sharpener with a video clip showing how it works very well on all pencils so I have ordered this too. " Feel - I was blown away with the first strokes. I'd been using Marco Raffines which are a bit scratchy but these are silky without the stickiness of Prismas. Also the leads don't have the Prisma breakage problem and they sharpen well, holding their points well too. The pigment smooths out with Gamsol and the colour intensity holds. Colour range - No one is going to be entirely happy.! We always want more! 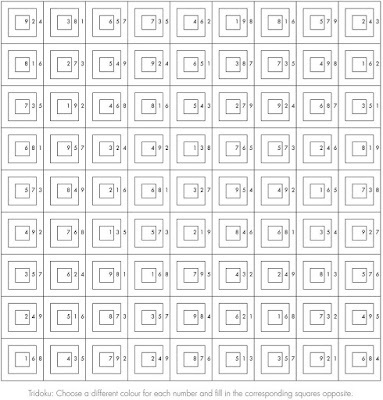 I like that there are fewer pale shades and most are in the medium to dark range. Love the dark greens. I would have liked fewer bright yellows and instead some more murky yellows and olivey greens. The reds are fine. Blues okay although I would have liked a greyer blue. Dark browns are good but I'd like some more taupe shades. Not much in skin tones but that's okay as I have my trusty Derwent Skintones. Few greys too. Yes, the colour on the end of the pencil often isn't even close to the lead colour so you'll need to do a colour chart. Value - awesome. Very good value. The tin they come in is the best pencil tin I've come across. Perfect size, it snaps shut and the pencils are really snug. - Please note that two of the above people have had a double-up in their tins which means that one colour is missing. They have got in touch with Tania from Goodyism who has been very apologetic and the issue was resolved very favourably. So please when your tin arrives, check carefully. The picking error is apparently happening in China. - The pencils haven't been tested for colour fastness yet. 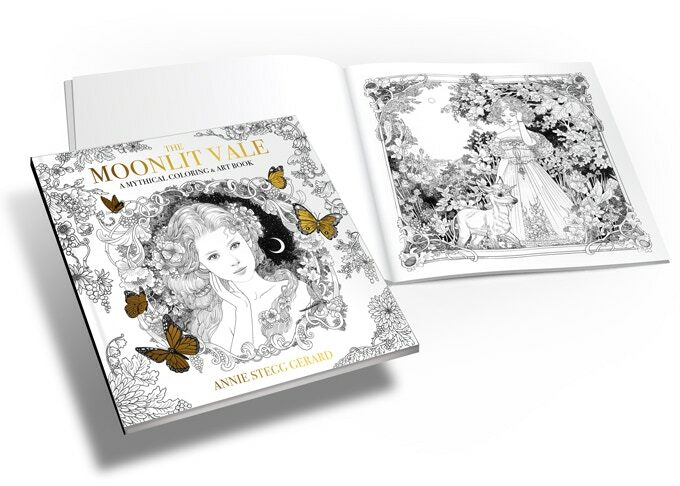 - The other issue is that if you are buying via Amazon US and you live in New Zealand (possibly other countries too) please pay the top shipping rate or your pencils may never leave the US. I blogged about this - here. 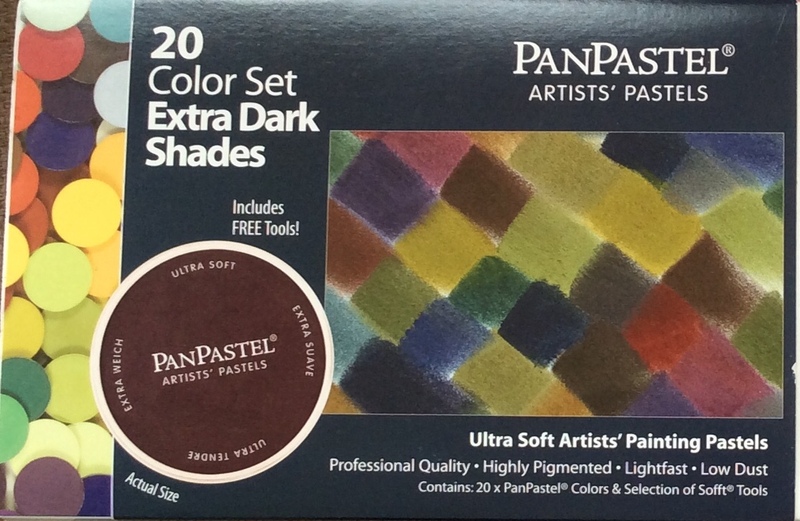 Extra Dark PanPastels - here. (select top shipping cost to NZ)! You can find me on Facebook - here.